——Building harmonious cities is a social ideal that mankind has made unremitting efforts to pursue. With the arrival of the era of globalization and informatization, urbanization of different countries has been sped up. Mankind, while enjoying material wealth brought about by cities, has to face dozens of serious problems such as how to effectively prevent and avoid environmental pollution, traffic jam, ecological degradation, waste of resources and outbreak of epidemic diseases. We must work hard to seek an approach to city development that can ensure living quality of people, freedom of survival of offspring and sustainable development of cities. ——In building harmonious cities, it is essential to timely find and solve new problems arising in the development of cities. Cities constitute an important landmark of human civilization development, a driving force for regional economic growth and an important carrier of economic globalization, and they play a huge role beyond parallel in the prosperity and development of the world. More and more people live in cities. It is the basis for maintaining urban vigor that issues appearing in the development of cities be solved properly such as employment, social security and increase of quality of living environment for urban people. Urban governments should adhere to the concept of people-orientation, serve to eradicate poverty, improve educational, health-care conditions and public welfare, work to create more jobs, build equal development environment for social members, especially for youth, women, minority ethnic groups and disabled people, realize and safeguard social justice, seek more benefits for people. ——In building harmonious cities, it is essential to formulate scientific and forward-looking planning for city development. Cities of deferent countries should, proceeding from conditions of their own countries and cities, seek development. This is a fundamental solution to respond to the opportunities and challenges brought about by economic globalization. The key to take initiative in and accelerate development lies in determining development roads and modes that suit realities of the cities concerned. Participant cities should fully exchange and share experience in development, strengthen exchange and cooperation, extensively learn and adopt achievements of modern civilization, and enhance capacity for self-development. And we should fully tap potential for social development, optimize economic structure, shift mode of economic growth, rationalize distribution of urban space, embody characteristics of different cities and eventually reach the goal of harmonious co-existence of man and nature. ——In building harmonious cities, it is essential to throw away resource-consuming outlook of development and establish concept of building resource-cycling society. We should accelerate to establish system of local laws and regulations and policies, system of innovation and mechanism of incentive and restriction. We should work to enhance the efficiency of resource utilization and reduce volume of end-disposal of wastes. “Green” consumption will be pushed forward and system for recycling renewable resources be improved. Efforts will be made to build resource-conserving and environmentally friendly cities. 1. Keeping to the orientation of people, we will work to seek and accomplish urban harmony and unity, achieve balance among nature, ecology, economy and society, advocate the urban development outlook of respecting, adapting to and giving priority to nature. 2. We will work to pursue new driving force for urban sustainable development by building resource-conserving and environmentally friendly cities, reducing consumption of energy and resources, exploiting non-pollutant and renewable alternative energy sources. 3. Urban governments have responsibility to encourage local non-governmental institutions to participate in the development of cities. Urban governments should also build an environment for liberalization and facilitation of investment and trade, promote equal cooperation among urban business groups in trade and investment and reach a win-win end. 4. We make a common commitment to create more job opportunities, education opportunities and better medical conditions, pay more attention to social security, public health security and food security and bring more welfare for the people. 5. We firmly believe that the Asian-Pacific City Summit is a platform by which we can effectively intensify inter-city exchange and cooperation. We will join hands to build a more prosperous, stable and harmonious Asia-Pacific region. 6. 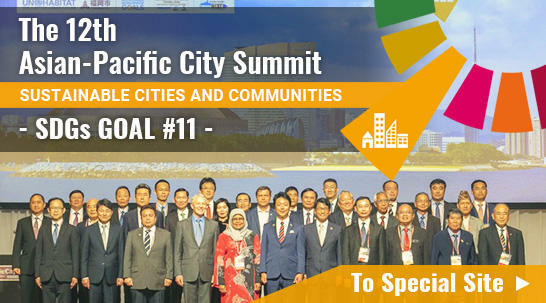 This summit meeting made a decision that 7th Asian-Pacific City Summit Working Level Conference be held in the City of Kitakyushu, Japan in 2007 and the 8th Asian-Pacific City Summit be hosted by the City of Dalian, China 2008. Mayors and representatives attending the conference are sincerely grateful to Chinese Government for its attention and support to Asian-Pacific City Summit, and grateful to the Government of Urumqi City, Xinjiang, China and to the conference secretariat for its hard work.